“Argh! My key won’t come out of the ignition!” If that’s every happened to you, you know how stressful it can be to have your car key get stuck in the ignition of your vehicle. You may panic while you try to figure out how to get it out since you can’t just leave it in the ignition with the doors unlocked while you go in to work, your home, etc. Whatever you do, DO NOT attempt to use brute force to get the key out because you could end up breaking it off completely. Then you’ll have a much bigger problem on your hands. Any car key in an ignition should easily slide out after you have completely rotated it counterclockwise and (if applicable) pushed the key release button. If the key won’t come out of the ignition, then you need to understand the possible cause of this problem. There are a variety of reasons as to why your car key won’t come out. Some of these reasons may pertain to a unique problem in a specific make and model vehicle. However, most causes of key sticking are universal and can happen in any make and model vehicle. You just need to understand these causes so that you can figure out the solution to the problem. Below are the top 7 causes of a key getting stuck in the ignition. The gear of the transmission must always be set to “Park” before attempting to remove a car key from the ignition. In an automatic transmission, if the gear is set to drive, neutral, or any other available gear, then the key will not come out. 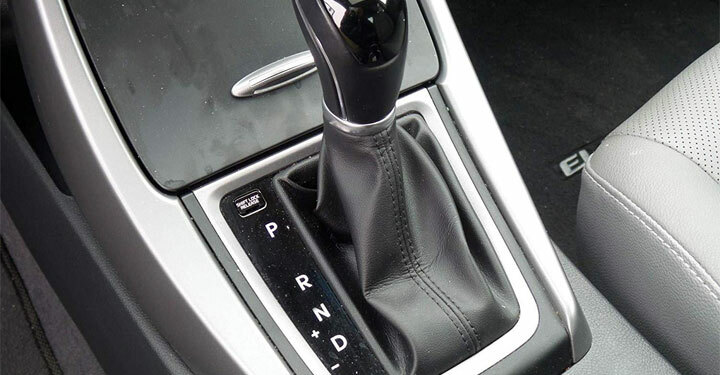 In a manual transmission, make sure the gear shifter is set to “Neutral” and not in any other gear. Sometimes people may attempt to change the gear to park, but the gear doesn’t get set all the way over to it. If your vehicle has a digital screen which displays the gear settings, check that to ensure the “P” is highlighted. If you turn off your vehicle while moving the steering wheel just a little bit, the steering wheel lock will activate. Not only will this prevent you from turning the steering wheel, you won’t be able to pull out the key from the ignition either. This is due to the ignition cylinder locking at the same time as the steering wheel lock. To release both locks at the same time, try turning the key while wiggling the steering wheel around. You should be able to take the key out now or start the engine. Some people like to open boxes and packages with their car key. While this might be effective at tearing through the box tape, it could also cause pieces of the tape to stick to the key. 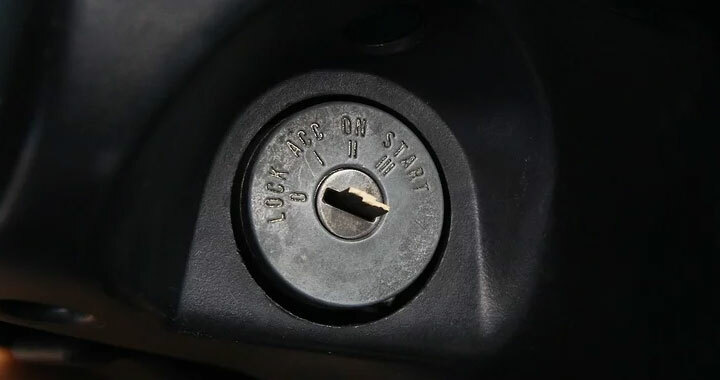 If you were to then place the key into the ignition of your vehicle while the tape is still stuck to it, then it will be harder for the key to engage the ignition cylinder’s pins. The ignition system depends on power from the battery to function properly. If the battery dies, it will likely cause the ignition system to lock up. Then you won’t be able to get the key out of the ignition. The best thing you can do here is to wait for a jump start or new battery to be installed. Either that or use a tack hammer and gently tap the cylinder with it. Car keys can take a lot of abuse over the years. Each time you put the key in the ignition and turn, it wears the key just a little bit. When aren’t not using your car key, you may keep it in your pocket or toss it onto a hard-surfaced desk. This kind of abuse will slowly damage your car key. If it ever bends or forms a small crack somewhere, then it will be tougher to remove it from the ignition. Replace the key immediately if you start noticing this damage. 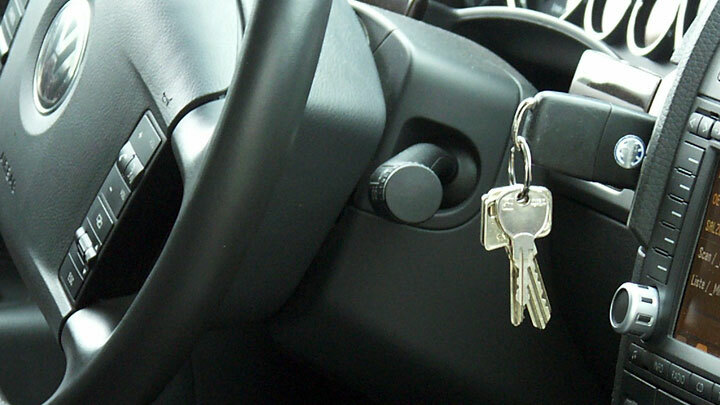 If you have an ignition lock cylinder that’s on the verge of failing, it can prevent your key from coming out. This is because there are several rows of spring-loaded pins inside the ignition lock which match up with the shape of your key when inserted. If these pins are slightly out of alignment, it can prevent you from removing the key (or even inserting it in the first place). While rare, there is the possibility that your particular year, make, and model of car or truck is subject to a recall or technical service bulletin (TSB) directly related to the ignition lock cylinder. You can check to see if your vehicle is affected by entering your VIN number in the National Highway Traffic Safety Administration (NHTSA) website. Even if it’s not, it’s a good idea to check to get the status of any other outstanding recalls or TSBs. Getting your car key unstuck from your ignition is dependent on the situation. Is this the first time it won’t come out? Does the key keep getting stuck in the ignition? Did you already try to get the key out and ended up breaking the key? Here’s what you should do in each situation. The most common reason for not being able to get the key out is that your car’s parking gear is not set. Confirm your gear selector is set to “P” or “Park” on an automatic transmission or the shifter is set to “Neutral” in a manual transmission. If you’re sure that you correctly set the gear and the key still won’t come out, try slowly jiggling the steering wheel back and forth while you gently pull on the key to remove it. Sometimes when the steering column locks (a safety and anti-theft feature in most cars), it puts additional pressure on the ignition lock mechanism and prevents the key from coming out. By slightly moving the steering wheel, the pressure on the lock is removed and the key should slide out. If you’ve noticed that it’s been slightly more difficult to get your key in and out of the ignition over time or the key keeps getting stuck in the ignition, here are a couple things to try. Try spraying a little bit of WD-40 into the ignition lock. The can should come with a thin straw that should fit (or almost fit) into the space between your key and the ignition lock. Sometimes, this additional lubrication will be enough to allow the key to be removed by gently wiggling it. Once the key is out, inspect it for damage or any sign of being bent. If that’s the case, you’ll want to have the key replaced. If the key is not damaged but you notice some dirt or gunk on the key, take some rubbing alcohol or adhesive remover (ie: Goo Gone) and thoroughly clean the key. If using WD-40 to remove the key doesn’t work and you’ve already tried the two fixes in the section above, you may have a problem with the ignition lock itself. You’ll want to contact a locksmith or mechanic to confirm this but an ignition lock cylinder replacement may be in your future. Hopefully, this hasn’t happened to you but if it did, you’re not the first person. Usually this happens when too much force is used to try to remove a stuck key. Here’s what you can do. NOTE: DO NOT try to reinsert the broken top half of the key to get the bottom half out. All you’ll do is push the broken off part further into the lock and make your job of removal more difficult. Use a key extraction tool to remove the broken key. This is often something a professional locksmith would use and usually much cheaper than calling one. There are a few different types but this one does the best job of removing a key that’s broken off in a lock (any type of lock). Because a jigsaw blade is so thin, it can often fit right alongside the key withing the ignition pathway. After inserting the blade, turn it ever so slightly so the notches in the blade grab on to the broken key, and then slowly pull it out. If any part of the key is still protruding from the ignition, tweezers or needle nose pliers are an easy solution to get it out. But, if the broken key is completely in the ignition lock, these tools are probably too thick to do much good. When all else fails or you simply want to make sure it’s done right, call a locksmith. It may cost a bit more upfront but they’ll get the job done. The first time my key got stuck in ignition, it was only the tip of the key. The key came out, but the tip got stuck. Second time, the entire key was difficult to get out, but after wiggling it some it roughly came out. What do these situations indicate? Either the end of the key is beginning to wear out or the ignition cylinder may be worn or even damaged. You could try spraying a *little* WD-40 inside the ignition cylinder to see if that will loosen up the pins a bit inside. Then insert the key a few times to see if that helps. Did not put car in park now I can’t get the key out or put the car in park! Wahh whet the heck! It’s possible the thief caused a bit of damage to the ignition cylinder. 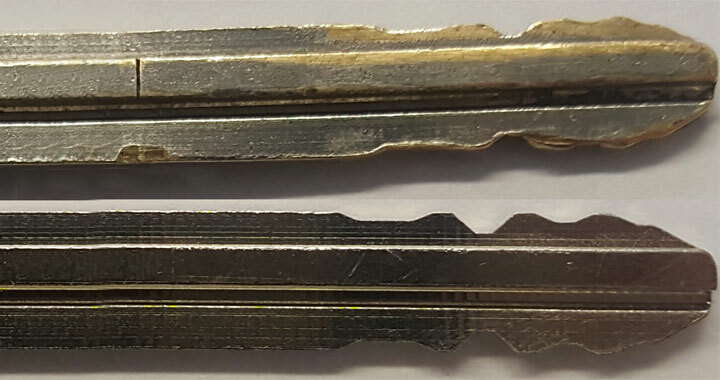 If your key is in good condition, try spraying a bit of WD-40 in the cylinder and wiggling the key around. If that doesn’t help, you may need to replace the cylinder.